One thing is clear after Raiders owner Mark Davis and company blew up, in a matter of days, their partnership with the Las Vegas Sands Corporation and jeopardized their bid to move to Nevada: the players, and Raiders fans everywhere, deserve better than the people who are in charge. What’s not clear, after hearing the Sands’ side of the story, is whether the Raiders unwittingly sabotaged their chances or acted in bad faith. The team submitted a draft lease that cut out casino and resort magnate Sheldon Adelson, and they changed their minds on a number of key negotiation points, such as non-football stadium event profits and stadium branding. Either way, a Sands rep described the latest developments in an extensive interview with the Las Vegas Review-Journal as a stunning miscalculation. Even so, it’s hard to imagine a group of men in charge of one of the most iconic franchises in sports—an organization worth roughly $1 billion—wittingly and knowingly inviting an Adelson rep to a stadium committee meeting, then submitting at that very same meeting a lease proposal that cut out Adelson. But that’s exactly what Davis, Raiders president Marc Badain and executive vice president Dan Ventrelle did in late January, baffling their guest, Andy Abboud, vice president of government relations and community affairs for the Las Vegas Sands Corp.
A Vegas deal could still get done, but several officials involved in the stadium approval process aren’t sure the Raiders could find a better suitor than Adelson, who took the project on, in part, as a legacy for Las Vegas. A public apology to a scorned business partner who hasn’t been shy about withdrawing his sizable investment would have been an unimaginable scenario when Mark’s father, Al, was running the team. But these aren’t Al’s Raiders. A once-proud franchise finished the 2016 season last in attendance despite the team’s resurgence on the field, and it has made little headway with local politicians in efforts to replace or renovate the aging Oakland Coliseum. Further, Mark Davis has made no bones about straying from his father’s management style, exonerating those who had fallen out of favor with Raider Nation (Marcus Allen comes to mind) and healing old wounds with NFL owners who had rejected Al’s bid to move to Los Angeles in 1982, which the elder Davis did anyway. Part of mending fences, of course, involves carrying the league’s water and furthering its agenda. If the Raiders tried to overplay their hand in changing their minds about their level of control over the stadium, it may have stemmed from pushback by NFL owners on the involvement of a casino group and the still-taboo world of legalized gambling making it’s first foothold in the NFL with the keys to a stadium. 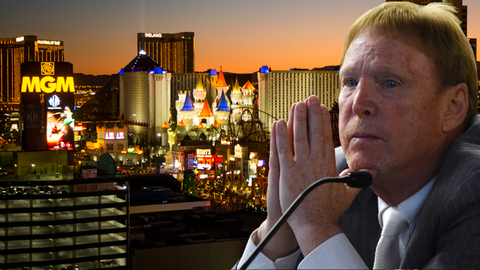 But the only card Mark Davis was holding in his bid to secure a state-of-the-art home for the Raiders was his new relationship with Adelson, who had committed $650 million before things fell apart. Now he has nothing, and the NFL has a bigger problem than the Chargers fleeing San Diego for a double-booked Los Angeles. The Raiders are floating in an awkward and costly limbo between a city that won’t pay for them to stay and another that isn’t exactly clamoring for them to come.